The DL200TC-5 is designed for loading and carrying, and it has a parallel-lift linkage system. With increased visibility down the center of the parallel-lift arms, operators can clearly see the ground, truck or work area in front of the machine when placing loads. 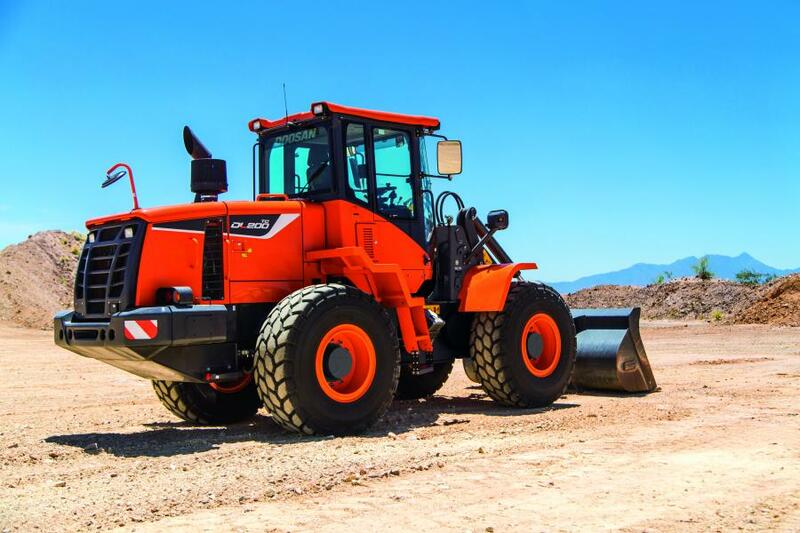 Doosan Infracore North America LLC, will display a variety of heavy equipment in its booth – C5577 – in the Central Hall at the Las Vegas Convention Center during the annual World of Concrete in Las Vegas, Jan. 22 – 25, 2019. On display will be a Doosan DL200TC-5 tool carrier with a quick coupler and pallet fork. Also in the exhibit will be a DX140LCR-5 reduced-tail-swing crawler excavator with a quick coupler and DXB100H hydraulic breaker. The excavator will be configured with optional rubber track pads, a dozer blade and the window guarding package for enhanced uptime protection. The DL200TC-5 is designed for loading and carrying, and it has a parallel-lift linkage system. With increased visibility down the center of the parallel-lift arms, operators can clearly see the ground, truck or work area in front of the machine when placing loads. In addition, the parallel-lift linkage system keeps the work tool flat as it is lifted rather than rolling back, an advantage when lifting pallets and other loads that need to stay level. The machine features a hydrostatic transmission, giving operators more power, improved fuel efficiency and better precision while working. Operators can choose between three power modes – power, standard and economy – that adjust the maximum engine rpm. Unique to the hydrostatic drive system, the engine rpm is not directly correlated to the machine's travel speed, so the maximum travel speed remains unaffected. In addition, wheel loader operators can choose from three traction modes – max, traction control and S-Mode – to easily adjust traction force to match jobsite conditions for more efficient operation in digging, stockpiling and loading applications. The machine is available in a high-lift option for additional lift height and reach to more easily load materials such as cement into high-sided trucks. Approved attachments: general purpose, light material and multi-purpose buckets; pallet fork; and quick coupler. Lift, carry and place a variety of materials with the pallet fork attachment. The attachment helps in a variety of construction applications and offers multiple carriage widths and tine lengths. 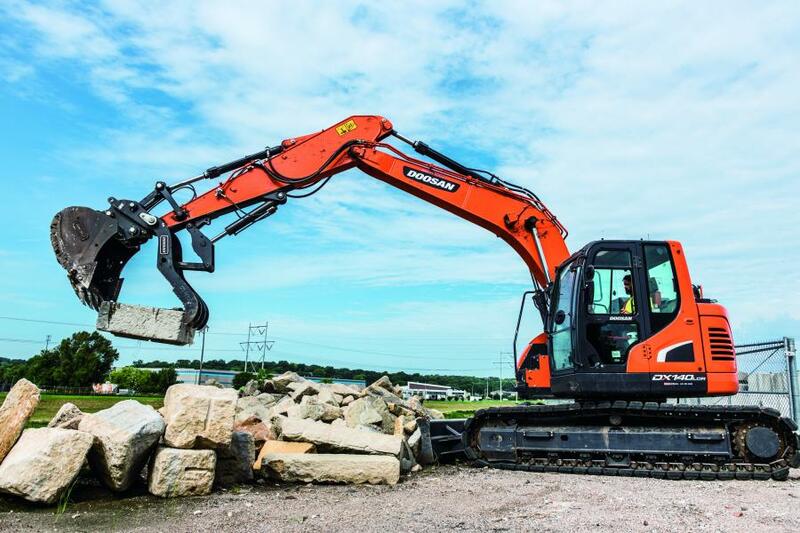 The DX140LCR-5 excavator offers a shorter tail swing, allowing operators greater flexibility where space is a premium without sacrificing performance. DX140LCR-5 excavators are designed for long life with an extra-sturdy frame and reinforced superstructure. They come standard with permanently sealed and lubricated track links, and the workgroup bushings and hard-wear disks are designed for reliability as well as extended service intervals to increase uptime. A standard 7-in. LCD screen allows operators to continue monitoring the excavator parameters while viewing the rearview or sideview camera image. Critical machine data appears next to the camera view. With an available side camera, a split screen allows both camera displays to be viewed at once. Paired with a hydraulic quick coupler and a DXB100H hydraulic breaker during World of Concrete 2019.